So Long Dr. Ben, we hardly knew ye. I am sure some of his evangelical devotees will continue to stick with him a while longer, but his campaign is for all intents and purposes as dead as the walkers on “The Walking Dead”. But unlike Glen’s death (or fingers crossed near-death. We will all find out Glen’s fate on November 8th ) I doubt too many people will shed a tear when Dr. Ben eventually drops out of the race. 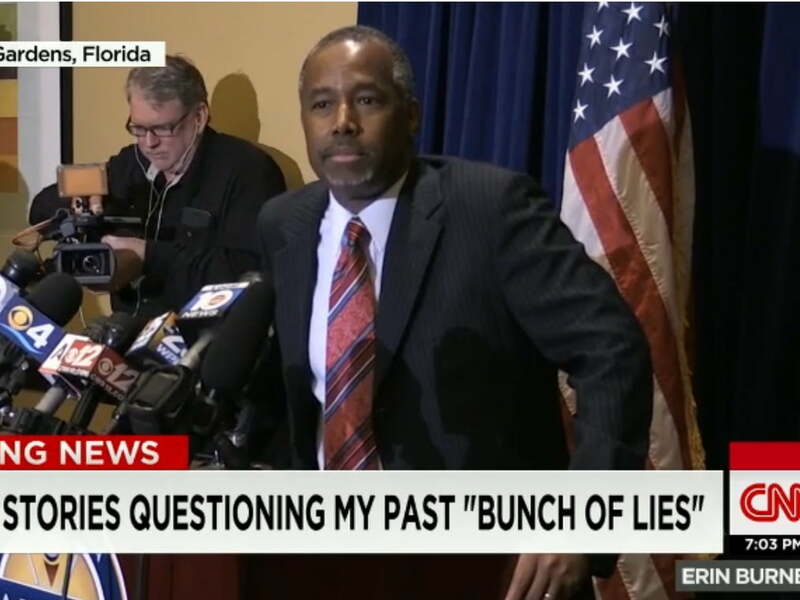 There was always something just a bit “off” about Carson with so many outlandish statements he has made in the past. Here are just a few highlights of the some of his more outrageous comments. 3. Blaming Jews for being killed in the Holocaust “There comes a time when people with values simply have to stand up. Think about Nazi Germany. Most of those people did not believe in what Hitler was doing. But did they speak up? Did they stand up for what they believe in? They did not, and you saw what happened.” – Carson comparing Democrats and those who voted for President Obama to Nazis. 7. The Big Bang is a “fairy tale” and the notion of evolution was encouraged by the devil. I find the Big Bang really quite fascinating. I mean, here you have all these highfalutin scientists and they’re saying it was this gigantic explosion and everything came into perfect order. Now these are the same scientists that go around touting the second law of thermodynamics, which is entropy, which says that things move toward a state of disorganization. So now you’re gonna have this big explosion and everything becomes perfectly organized and when you ask them about it they say, ‘Well we can explain this, based on probability theory because if there’s enough big explosions, over a long period of time, billions and billions of years, one of them will be the perfect explosion.’ … So I say what you’re telling me is if I blow a hurricane through a junkyard enough times over billions and billions of years, eventually after one of those hurricanes there will be a 747 fully loaded and ready to fly. (Carson adds that the Big Bang is “even more ridiculous” because there is order to the universe.) Well, I mean, it’s even more ridiculous than that ’cause our solar system, not to mention the universe outside of that, is extraordinarily well organized, to the point where we can predict 70 years away when a comet is coming. Now that type of organization to just come out of an explosion? I mean, you want to talk about fairy tales, that is amazing. 8. There’s no war on women; there may be a war on women’s insides. In a speech on the steps of the Arkansas Capitol in Little Rock, Carson took on the notion that Republicans are waging a war on women, saying: “They tell you that there’s a war on women. There is no war on women. There may be a war on what’s inside of women, but there is no war on women in this country.” Whatever the hell that is supposed to be mean. He has yet to explain this comment. There is no question he is a very smart man and talented surgeon, but sometimes people can be very smart in one field and really dumb in pretty much everything else. His embarrassing interview on CNN today sealed his fate. There is also the problem that certain smart people become famous and because of that fame and social status they think they know more than experts in other fields. I have no explanation for all Carson’s really weird and ludicrous statements that fly in the face of science, facts, and just commons sense. I also have no explanations for his embellishments or outright lies about West Point and all his other childhood fabrications including the fib about an incidents at Church’s chicken. I do know that right-wing ideologues are often prone to conspiracy theories and are very gullible because of their distrust of what they call “lame-stream” media. There seems little doubt now that many of his outlandish tales are either completely fabricated or he took a small kernel of truth and added many extra details in the hopes of making it “juicy” to the point that it was complete fantasy after a fashion. There is the additional possibility that he has told these fabricated stories for so long that he actually now believes them to be true himself through self-delusion. Tell a lie often and long enough and it is not impossible you even begin to believe it yourself. The human memory is really not very good and we can manipulate our own memories. That is why eyewitness reports of crime scenes offer differs vastly depending on who you asked at the scene. In fact 75% of wrongful convictions are a result of unreliable visual memory! I seriously doubt that is the case with all of Dr. Ben’s tall tales but is at least a plausible theory. My personal opinion is that he just wasn’t prepared for the thorough vetting he received as a presidential candidate and has decided to double-down on the yarn he has been spinning. But now that very same yarn that built him up as the darling of the tea party is going to asphyxiate his campaign now that the truth is coming out. Who knows why Dr. Ben Carson lied. He also was denies getting money from Mannatech which is also a lie. Additionally it appears several sections of his recent book were also plagiarized. There is also another example of him lying about a psychology test at Yale. His reasons for lying may have been intentional or not. It matters not due to all his other whacko statements and simply bizarre beliefs. His monotone almost robotic voice is annoying enough because it makes people almost fall asleep, but mix in a dash of loony tunes with a forked tongue and Dr. Ben’s campaign is now officially kaput….. whether he knows it or not. All of the GOP hopefuls need a mental checkup, many of their supporters need to take their med’s. I read a comment on another site earlier this week from a doctor who had attended an event at Johns Hopkins [when she was in medical school] where Carson gave a speech. She noted that he and the other doctors there had a god complex. She went on to say that this god complex makes some doctors believe that because they know medicine, they know other things, too. I know history, politics, and government well because I studied them in undergraduate and graduate school. I don’t know medicine, so it would be useless for me to pretend that I do. We all have limits, but it appears to me that Dr. Carson seems to believe that a successful medical career automatically means he’d be a successful politician. He’s finding out that it’s not true, and he’s having a hard time recognizing and acknowledging the limitations of his knowledge on a variety of political issues. It’s better for him to find out now than it would be for him to find out later if he were to be sworn in as our next president. One thing I don’t “get” about Carson is his constant whining about being picked on by the media when the media is only reporting exactly what he has said/written/done. This makes me question his integrity. If he said things in the past that he now regrets, he should just admit he said them, and say that he’s changed his mind over time, but to become a constant WATB is very unpresidential.